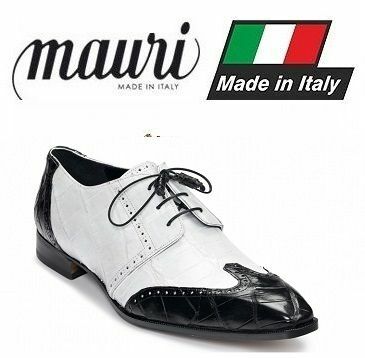 Mauri shoes are Jaw Dropping Alligator Shoes designed in Italy and made in Italy. When compromising is just not in cards and you want the absolute best hand made alligator or crocodile shoes made in Italy to buy in bold styles, Mauri shoes is simply the brand to buy online. Their design team is constantly coming out every season with styles of Alligator Shoes to buy like you've never seen before. Mauri alligator shoes are made in Italy and have a uniqueness with fancy pointed soles and toe caps or extreme sleek silhouettes that set them apart from many other alligator shoe brands and go great with high fashion style Mens Blazers. It's become a fact that Mauri is the one brand that seems to get copied by all the other alligator and crocodile shoe companies because they seem to be setting the trend with their wild and modern Italian shoe styles. They wouldn't get copied if they weren't the best alligator shoes and Crocodile Shoes. If you pay close enough attention, watch the new season of alligator skin shoes that Mauri introduces, and you can bet your bottom dollar that the following season, you'll find several makers coming out with the exact same style that Mauri shoes introduced previously. Their in house Italian design team are constantly monitored to keep coming up with fresh ideas for purchase just because they feel that they have to come up with completely new looks every season to give people a reason to have these luxurious exotic shoes on their feet. Bump up your "A" game by wearing some Stacy Adams Shoes with style. Mauri alligator dress shoes feature cutting edge Italian design and style and are exclusively made in Italy. You'll find Professional Athletes and Celebrities swear by Mauri Alligator shoes with their unique head turning style and uncompromising quality and luxury that only alligator shoes made in Italy can provide. When it comes to exotic skin sneakers, one designer rises to the top. Mauri. Mauri is also well known for exotic skin sneakers when it's time to dress casual. Their Italian style is thorough since they are not only designed in Italy but are made in Italy as well.